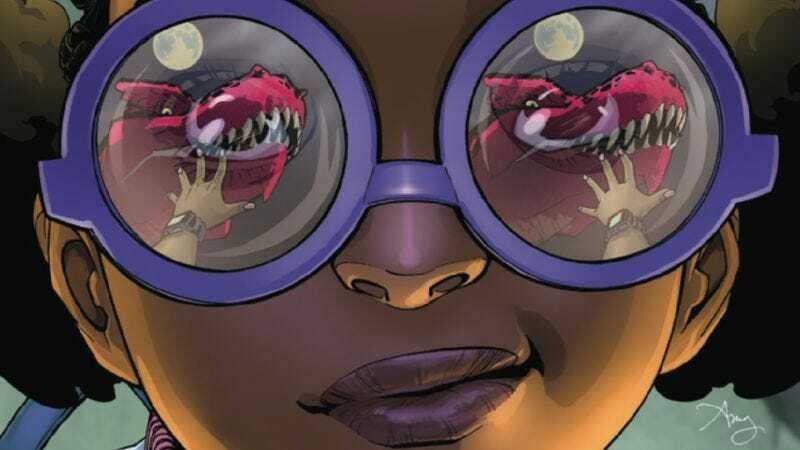 Moon Girl & Devil Dinosaur has done phenomenal work using its central conceit of a superpowered preteen and her giant red dinosaur to explore real issues facing prepubescent young girls. In the book’s first arc, Lunella Lafayette’s fear of being exposed to the Terrigen mists that activate her Inhuman DNA was a metaphor for the fear of adolescence and the uncertainty of not knowing what kind of person you’ll become when you grow up. Lunella’s powers have been activated in the second storyline, and her new ability to swap minds with her T. rex is a metaphor for the hormonal mood swings of the teenage mind, sending the raging Devil Dinosaur into Lunella’s body whenever she gets too emotional. Writers Amy Reeder and Brandon Montclare have a strong handle on how superhero stories can be used to enlighten everyday reader experiences, and that grip gets even tighter as Lunella discovers that her newest enemy has developed a crush on her. Mel-Varr/Marvin Ellis/Kid Kree has been a thorn in Moon Girl’s side for the last few issues, but in typical young boy fashion, his antagonism hides his growing affection. Lunella is far from thrilled by his confession of love, and these preview pages of next week’s Moon Girl & Devil Dinosaur #12 detail her prickly reaction, which is intensified by her connection to her prehistoric pet. Artist Natacha Bustos’ skill for drawing young characters amplifies these juvenile emotions, as does colorist Tamra Bonvillain’s vibrant, expressive palette, which has been an essential part of this book’s charming visual aesthetic. Moon Girl & Devil Dinosaur has only gotten deeper and more entertaining with each new issue, and it’s nice to see Marvel continue to support a title that may not be the hottest seller, but is doing exciting, meaningful work with the superhero genre that can be appreciated by all ages.